In order to promote RP within the guild, we have created the RP call board. Take these prompts and make a great story out of them. At the back of the Den, a crude wooden board has been mounted. Carved roughly into the surface at the top of the board, the Päck's familiar wolf's paw gazes down on any who come by it. Posted here are quests of great importance, as assigned by the Alpha, Elders, and Betas. Nailed to the wood are several pages, each hand written and signed. Scouts have reported seeing unfamiliar worgen going in and out of Shadowfang Keep. While we are aware that the Hounds frequently use this abandoned fortress as their base of operation, the shadows are only seen in their absence. We need someone to investigate this matter. A hired ship filled with supplies such as blankets, food, medicine, armor, weapons, and ammunition was supposed to arrive days ago. The vessel would have traveled within sight of the coast from Menethil Harbor, but we have no indication of where it went missing. 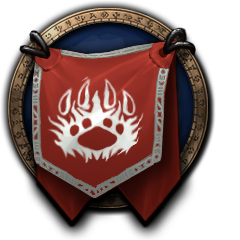 We need to secure our supply route or we won't be able to adequately maintain our hold over Gilneas. I will be taking "Wor-gone Without A Trace" I will schedule something on Next Tuesday for it. I'll be writing a short story based on the quest These Eyes. Though I'm sure more than one person can do this quest. I'm going to grey it out anyways, but anyone who wants to also take part can talk to you. I will be taking I sense a tremor in the link are you cool if I add a Twilight cultist for the sake of having pure mind magic for the sake of this quest? And I would like to take Make me a Surwich if that is alright, perhaps I can make an event? Sephile and Sarnor, you're both approved, remember you have one week to complete the quest. I will be taking Shadows within Shadowfang for this Friday.